Have you played Splendor? If not, you really should. It’s a great game where you play a gem merchant, collecting gem resources to buy better and better mines and shops to sell your wares. Purchasing these mines and shops give you permanent gem resources, allowing you to buy better mines and shops and so on. The game is fantastic because of the huge ramp that becomes available to you during play. At the start, you strive for the most basic mines. By the end, you could buy those on a whim, but you’re on the lookout for better and better storefronts. The game ends when someone hits fifteen victory points, so its important for players to build a gem engine, gathering points as quickly as possible. When you do? It’s a very satisfying experience. In theory, that’s how the game is supposed to work. The Splendor problem is that this isn’t the key to victory. One day, I decided to play in a Splendor tournament in Portland. As I recall, the winner would earn some promo goods, but I admit that I lost focus on the prize very quickly. This was the day I learned about the Splendor problem. 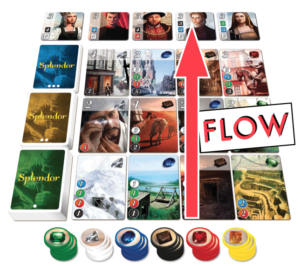 Splendor is a game that has a flow in mind. The cards at the bottom have a low cost, but low victory point value. So you grab gems to acquire them, which takes a couple turns. Once you have enough of those, they help you grab the second level of cards. These help you take the third level, and you can finally grab the Lords at the top. The Lords require you to own certain colors of gem cards, so players are careful about what they acquire during the game. This flow is built into the setup of the game, the rule book, and the playmat. Sadly, it’s all wrong. During the tournament, three of us played with the flow. The fourth player had been taught the real strategy. As soon as I saw it implemented, I recognized that the flow was wrong. Building a gem engine wasn’t the key to victory. Instead, players should use highly targeted efficiency. Skip level one cards entirely. Find a level two card that only requires one gem type. Reserve that card, granting you a wild Gold token. Take only that gem resource. Eventually, acquire that card. Do it again. Then move to level 3. Have fifteen victory points before anyone else hits six. Why does it work? Beyond being ruthlessly efficient, this strategy also requires you to take most of a single gem type. Since other players need a wide variety of gems, they will find themselves starved for that gem type. This turns a vaguely competitive game into a different one, where efficient players are now controlling the resource market. It’s mean. I tried it once, instantly won, and gave up on the tournament. The Splendor solution brings back the fun of the game and, I hope, the original intent. 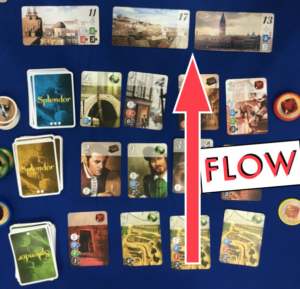 The new expansion Cities of Splendor adds four variants to the game. Instead of Lords at the top, there are Cities. These either require a TON of gem cards to get, or a massive pile of victory points. Plus, now the game doesn’t exactly end at a victory point total. The game ends on the round when someone gets a City, and only players with a City are in the running to win the game. When you add Cities into the mix, the game becomes a race to build a City as fast as you can. In this case, having a lot of gem resource cards is a huge advantage. Now, players have a realistic chance at victory no matter which strategy they employ. I am, of course, very interested to see how this expansion plays out in reality. In my demo, players seemed very excited to play with the flow of the game. But it still may be possible for that alternative strategy to win out with certain Cities. We’ll see! 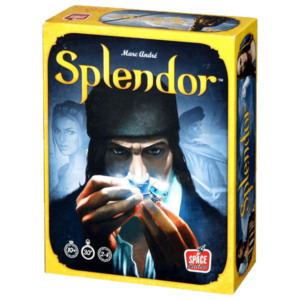 Plus, with three other variations I haven’t even discovered yet, I think this expansion is actually going to put Splendor back on my play list for a while! That might be the most welcome change of all.